Unimog stands for “Universal-Motorgerät” which roughly translated means “universal motorized implement machine”. Unimogs are multipurpose, all-terrain, utility vehicles built by Mercedes-Benz. In addition to extreme off-road capabilities, they are designed to be operated in some of the harshest conditions in the world. Unimogs are widely recognized as the most capable off-road vehicles in the world. The Unimog was primarily designed as a road going tractor intended to take a wide variety of implements - hence the name “Universal-Motorgerät”. The term "Unimog" is a general term that applies to many different vehicles in the same way that "Jeep" or "Land-Rover " refers to a wide range of vehicles. A 1950's CJ is a very different vehicle than a 1990's Grand Cherokee but the are both “Jeeps.” Although Unimog models differ greatly in many respects, all Unimogs incorporate the same design principle that make them such extraordinary vehicles. This principle is the combination of low gearing, torque tube suspension with coil springs, and portal axles with differential locks combined with a very strong chassis that allows for a high degree of flex. The result is an extremely versatile and capable vehicle which can be used in a wide variety of roles, from a tractor to an expedition vehicle. Below is a list of the primary design concepts that make the Unimog such an extraordinary vehicle. The portal axle design is a solid beam axle that incorporates a hub reduction. 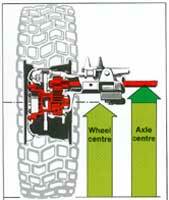 The result is a very strong axle with the axle tube and differential located above the center axis of the wheel. This means that the Unimog has greater ground clearance than a normal solid axle vehicle using the same tire size. The portal axles, combined with large diameter tires, means the Unimog has unrivaled ground clearance that is not even matched by most monster trucks! The hub reduction gears allow for extreme ratios while at the same time reducing stress to the rest of the drivetrain and allowing for even more gear reduction in the gearbox or transfer box. Torque tubes are an element of the Unimog suspension that many people are unaware of. The torque tube suspension dates back to the model T Ford which used this design for its rugged simplicity. 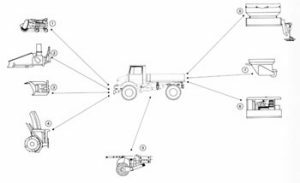 Instead of having trailing arms, multi-link suspensions or leaf springs which limit travel and cause the axle to get awkwardly contorted at extreme angles, the Unimog incorporates front and rear torque tubes. The torque tube extends from the transmission to the axle and encases the driveshaft. 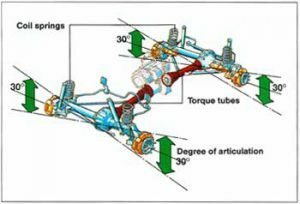 The axles and gearbox are essentially connected and as a result, no trailing arms or multi link suspensions are necessary. This system allows for extreme axle articulation but prevents the axle from being contorted when it is at extreme compression or droop. 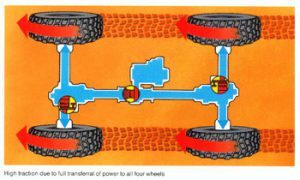 It also prevents axle wind-up and axle hop, and encloses the driveshafts and protects them from obstacles and the elements. Since 1948, Unimogs have always had coil springs front and rear and they were always designed to provide maximum articulation. Combined with the solid axles, torque tube suspension and the flexible frame, the Unimog has unrivaled articulation which allows for excellent traction even over extremely uneven surfaces. The coil springs also allow for a comfortable on-road ride. All Unimogs have very numerically high gear ratios which allow for crawl ratios that exceed the 100:1 ratio. The higher the ratio, the lower the gearing and slower the speed. With optional gearboxes, many Unimogs can exceed 3000:1 while still maintaining high ratio gears for driving on-road. On other vehicles, aftermarket ratios are sometimes available that exceed 100:1. However, few 4x4 drivetrains, including “heavy duty” ones, were designed to take the extra torque produced by these ratios. The result is other vehicles with extreme crawl ratios have unreliable and weak drivetrains that often lead to catastrophic failures. Unimog drivetrains are truly heavy duty and designed to handle the high torque of these extreme gear ratios. While other vehicles often fail at ratios of 150:1, Unimogs are designed to take ratios of 4000:1! 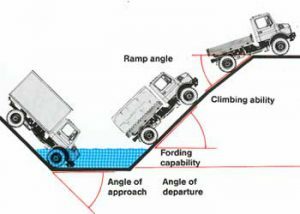 Virtually all Unimogs have at least 45 degrees approach and departure angles as well as phenomenal ramp angles. As a result, the Unimog is able to clear very large and steep obstacles without the body or chassis interfering. This also allows them to climb inclines up to 110 percent, giving the Unimog a higher climbing ability than any Land Rover, Jeep or Hummer. To this day, Unimogs are primarily built as tractors and implement carriers. As a result, all Unimogs (except the 404) are designed to take a wide range of implements; from snow blowers to cranes, and from dump beds to backhoes. Most Unimogs can take more implements then multipurpose tractors! Many Unimogs come with front and/or rear PTO's and hydraulics as well as three point hitch systems. In addition these features can usually be retrofitted by simply bolting on the various optional equipment. One Unimog can be used as a snowblower, backhoe, dumper, grader, brushhog, etc. The combinations are endless. As a result, Unimogs make an ideal tractor for small scale farming, land management and logging. 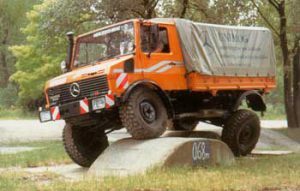 Some vehicles use elements of the Unimog design. For example, Humvees and Pinzgauers use portal axles while Land Rover Defenders use an excellent solid axle/coil spring suspension system. Furthermore, many vehicles can be retrofitted with locking differentials, larger tires or better suspensions. However, the Unimog is the only vehicle in the world that incorporates torque tubes, hub reduction, solid axles and coils springs and it is this combination that makes it one of the best off-road vehicles in the world and fundamentally different than other 4x4s. No other vehicle combines all the elements of the Unimog and, as a result, no other vehicle has the capability of a Unimog.